Disqus (a portfolio company of USV) has rolled out a really sweet analytics service as part of its "add ons" that were released a few weeks ago. You get the analytics as part of every add on package, including the $19/month Plus service. There are four main parts of the analytics service; snapshot, activity, people, and network. It's the network tab that has me the most interested. I'm always curious where the most active AVC community members hang out when they are not on AVC. Since Disqus is first and foremost a commenting system, "hanging out" means commenting for the purposes of this post. I'd like to see more than the top six. Ideally I'd like to see the top 25 or more. But this is a good start. 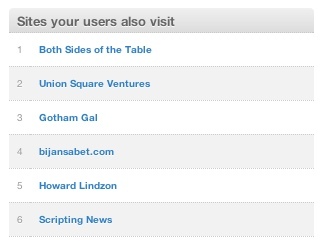 Happily I call each of these bloggers a friend, and one of them is my wife. If we had a dinner party with this group, it would be a blast. I'd sit Dave Winer next to Mark Suster and Howard Lindzon just to make things interesting. This suggests a whole new set of features for Disqus. If they know the communities with the greatest overlap with this community, they can and should build network tools so that readers of this blog are aware of what is going on across the network. If there's a great post/conversation going on at Suster's blog, we should know about that here at AVC and have a quick link to get there from here. Fortunately the team at Disqus knows that. I'm not announcing any features here. But I am pointing out that communities like AVC don't exist in a vacuum and there is a network of communities out there and Disqus is powering most if not all of them. And so there's a lot Disqus can do to make the network come to life in powerful ways. I'm looking forward to watching them do just that. It's monday and it's time to move on from the MBA Mondays series on Employee Equity. We did nine posts on employee equity and hopefully we moved the needle a bit on understanding that complicated topic. But just because they have the cash doesn't mean they will use it. There are a number of factors that acquirers consider before pulling the trigger on an acquisition. They look at whether the acquisition will improve or hurt earnings going forward. They look at how they will have to book the acquisition on their balance sheet. They look at how dilutive the acquisition will be to shareholders (even if it is a cash acquisition, they may need to issue employee equity for retention). And most of all, they attempt to determine how the acquisition will be recieved by their shareholders and what impact it will have on their stock price. I am calling this entire topic acquisition finance. I am not an expert on this topic but I've got a working knowledge of it and I am going to share that working knowledge with all of you over the coming weeks. I've spent much of this long weekend curled up on the couch reading Too Big To Fail, Andrew Ross Sorkin's history of the financial crisis of 2008. I've wanted to read this book since it came out last year but it took me a while to get to it. I'm enjoying it very much. I've got some fairly heavy background in mathematics. But some of the complexities of some of the instruments that were going into CDOs bewilders me. I didn't understand what they were doing or how they got the types of returns out of the mezzanines and the various tranches of the CDO that they did. And I figured if I didn't understand it and I had access to a couple hundred PhDs, how the rest of the world is going to understand it sort of bewilders me. He was not alone. Even the CEOs of the firms that sold these products had no better comprehension of it all. But the CEOs knew they were making billions in these markets and they pushed their firms to go farther and faster in search of more billions. That is called chasing returns. And it is the most dangerous form – chasing returns you don't understand. I have a friend who has worked on wall street for forty years and runs a large fund of funds. He told me his biggest red flag when he reviews the performance of the funds he is invested in is when the returns are "too good." When he sees that he gets on a plane and goes to visit the fund manager to understand where the returns are coming from. If he can't understand it, he withdraws from the fund, no matter how good the returns are. I'll take this conversation back to a market that I do understand – venture capital. The venture capital business is showing good returns for the first time in a decade. The sectors that are performing best are web services and early stage/seed investing. These are sectors we have been investing in for over fifteen years. We've seen these sectors boom and bust before and we'll probably see it again. We are committed to these sectors and have no plans to leave them. However, these sectors of the venture capital market are filling up with investors chasing returns. And some of them do not understand what they are investing in. I got a call a few weeks ago from an individual investor who wanted to invest in one of our portfolio companies. He asked about the company and from his questions it was pretty clear he did not understand the business very well. He went ahead and made an offer to invest. That scared me. I've been visited recently by a number of foreign investment vehicles, many of whom are investing billions of dollars of sovereign wealth. They all want to get into our funds and our deals. When I talk to them about why, they can't really articulate a cogent argument about the economic potential of the social web. But they see the returns and want some of them too. That scares me. The venture capital markets work well most of the time. Venture capital is not financial engineering. It does not involve slicing up securities into parts and selling them off in baskets (until recently). It is about making an investment to turn nothing into something. When that something becomes a real business, with real customers, revenues, and profits, the venture capital investor is rewarded with a return, often times a very good return. I do not think venture capital will ever turn into the kind of mess that the mortgage markets became three years ago. But I do think we are seeing signs of excess in the markets we invest in and I do think we are seeing investors chasing returns in deals they don't fully understand. That is a red flag. And I am choosing to observe it, pay attention to it, and share it with all of you. Yesterday we kicked off "office hours" for USV. We did it with this post on the USV twitter account. We got 68 responses in a few hours for 32 slots. So we've taken down the signup form (which is why the link in the tweet doesn't work). The first 32 responses will get priority but we will try to accomodate everyone who filled out a form in the coming months. The idea for office hours comes from our friends at First Round Capital and Foundry Group. Both Josh Kopelman and Brad Feld have written about the benefits of "first come first serve" meetings with no filters and no qualifications. We also believe in a level playing field for all entrepreneurs and have been wanting to do this for a while now. I'd like to recognize Gary Chou, the General Manager of the USV Network, for his work in getting this going. Gary's got a "can do" attitude and he's been putting together lots of new stuff for us and our portfolio companies since his arrival this summer. Another new effort from USV courtesy of Gary and Christina is our USV Jobs twitter account. We try to tweet out a job or two every day. We get the feed of job openings from our portfolio company Indeed and then we curate it to highlight interesting jobs in our portfolio companies. If you are interested in working in one of our portfolio companies and/or meeting with one of us for 15 minutes, I suggest you follow the USV and USV Jobs twitter accounts. Based on yesterday's response to office hours, we need to be doing more stuff like this. And with Gary and Christina's help we will. One hundred forty seven people have donated to the Donors Choose campaign we are running this month here at AVC. That's incredible to see. With five days left, we are on pace to raise $20,000 from about 175 people. Here is how we've done in prior years. So this is likely to be our biggest year ever and that's before the HP Match which will double the amount we raise for classrooms where young woman learn science and math. As many of you know, we are going to have a meetup to celebrate this campaign. It will be on December 8th at 6pm at Washington Irving High School right off Union Square in NYC. The meetup is open to anyone who gives to the AVC Donors Choose campaign. Here's the Meetup.com page for the event on December 8th. Please go RSVP if you plan to attend. We will have the list of all the donors at the event so you need to be on that list in addition to RSVP'ing. I believe that we will look back at this decade as the beginning of an economic revolution as important as the scientific revolution in the 16th century and the industrial revolution in the 18th century. We’re standing at the beginning of the entrepreneurialrevolution. This doesn’t mean just more technology stuff, though we’ll get that. This is a revolution that will permanently reshape business as we know it and more importantly, change the quality of life across the entire planet for all who come after us. I have had the pleasure of working with entrepreneurs for the past 25 years and as I get older I appreciate them more and more every day. Not only do we work with great tech entrepreneurs in our USV business, but the Gotham Gal and I invest personally in entrepreneurs who are working in other sectors. We've backed real estate entrepreneurs, restaurant entrepreneurs, non profit entrepreneurs, media entrepreneurs, food entrepreneurs, local businesses, and many others. We get such great pleasure from watching people imagine something and then create it before our very eyes. I hope Steve is right and we are on the cusp of the entrepreneurial revolution. Our economy needs something new and entrepreneurship can provide that. So I am dedicating this thanksgiving to all the entrepreneurs in our lives and everywhere else in the world. Thank you. There still are issues. When I went to show one of the HTML5 mobile apps later, my mobile data connection wasn't there and I couldn't load it in my Android browser. But a friend told me you could cache all the elements, including the database, on the phone and deliver an offline experience in HTML5 in the browser. I've always disliked the idea that we have to download apps on our phones when the apps we use on the web are loaded in the browser on demand. But I've accepted the mobile app paradigm as something we will be living with for the next five years. I'm not sure it's five years anymore. The thing I like about these kinds of apps is they are with you all the time and can be used in moments of downtime. As such they lead to higher levels of engagement. But because they are also web apps and connected to a web scale network, they can offer a lot of value that mobile only apps cannot. Since writing that post, I keep coming back to this theme again and again. I think it is a critical element for success in today's web startup environment. We had a dinner party the other night at our home. A friend asked me what the inspiration for the most recent AVC redesign was. I told her that I wanted AVC to feel like a mobile web site. I told her that I love how web pages look on the iPad and I wanted AVC to look great on an iPad. I was meeting with the team from one of our portfolio companies a few weeks ago and we were talking about a redesign of their new web service. I had told them I thought the initial design was too busy and too complicated to work well in the market. They showed me the iPhone app they were planning to release soon. I said "just do that on the web." And happily they told me they were thinking the same thing. I'm starting to think a unifying vision for all apps should start with the mobile app, not the web app. And so it may also be mobile first web second in designing web apps these days. NOTE: The numbers below are as of 2010. They have moved a lot since then. The Senior Team numbers have moved the most. I would not recommend using these numbers or you will be below market with your employee equity grants. I've been pretty clear as of late that I think the market for investing in web startups is getting overheated. When I talk to some people about this, they say "you should shut down and ride out the bubble on the beach." To which I say "we don't think we can time markets." If you had a crystal ball, then doubling down when the market is ice cold and folding your hand when the market is white hot would be a great investment strategy. But nobody has a crystal ball and timing markets is a lot harder than it seems. So I prefer to focus on pacing ourselves. What I like to say is "we should add the same number of names each year to our portfolio and put out about the same amount of cash each year." The number we try to add each year is 6-8 new portfolio companies. USV has been investing since November 2004 so we've been in business exactly six years. And we will have 37 portfolio companies soon. So that is almost exactly 6 new investments per year. We had 31 portfolio companies at year end 2009, so we've added 6 new names this year. I don't have the cash outlay numbers handy this sunday morning but I do know that it took us four years to put the 2004 fund to work. And or current forecasts are that it will take us four years to put the 2008 fund to work. So that's a good proxy for cash outlay per year. This strategy works particularly well in the venture capital business because we generally will make three to four investments in each company, spread out over a five to six year period. So no one investment at a "bubble valuation" will impact our average valuations across our portfolio. Said another way, we will invest in 20 to 25 companies per fund and we will have three to four investments in each company, so we will make 60 to 100 individual investments in any fund. If we spread those 60 to 100 investments over a six to eight year period, we can average out the valuation spikes and valleys. I observed this strategy at work in the first VC firm I worked for. The partners had been investing for fifteen years when I showed up and they had evolved into this strategy and taught it to me. When I left that firm and started Flatiron Partners in 1996, Jerry and I started out with a reasonable and steady pace. It took us about three years to put our first $150mm fund to work. But when we got our second fund of $350mm in 1999, we adopted a different approach. The first mistake was to raise a much bigger fund just as the market was getting overheated. The second mistake was to put that fund to work in 18 months. We went from putting out $50mm per year to putting out $250mm per year, just as the bubble was reaching its peak. The results speak for themselves. We made greater than 5x on that first fund. Eleven years later, we will be lucky to make 2x on the $350mm second fund.